With almost 500 more rigs than last year at this time, the Baker Hughes U.S. rotary rig count broke 900 Friday with another sizable jump of 16 new rigs exploring for oil and gas. The U.S. rig count now sits at 901. Of those rigs, 720 are exploring for oil, up 8 from last week, and 180 are exploring for gas, also up 8. Canada and the Gulf of Mexico also gained rigs this past week, with 5 additional rigs north of the border and 3 new rigs in the Gulf. By state, Alaska lost one rig and Colorado was down 2. New Mexico and Ohio each gained one. Louisiana, Pennsylvania and Wyoming each gained 2 new rigs. Oklahoma gained 4 new rigs, while Texas again topped the list with 8 new rigs exploring for oil and gas. According to Business Insider, this is the longest streak of rig additions since 2011. After the rig data was released on Friday, WTI crude was trading at the highest level in about a month. 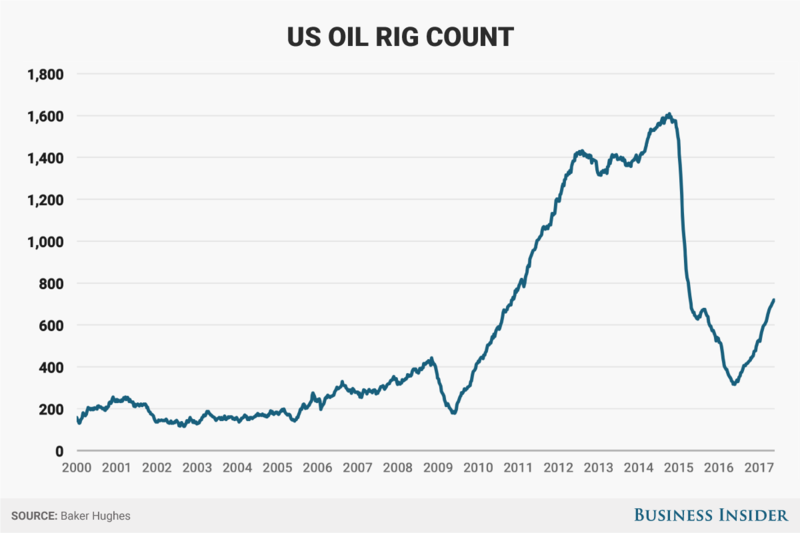 Business Insider’s graph shows a summary of rig count variances since 2000, illustrating the massive drop from 2014 to the end of 2016. Since then, the rig count has been climbing most weeks. The results from this week’s meeting of the Organization of Petroleum Exporting Countries (OPEC) could have an effect on the future rig count numbers. They will decide whether or not to extend the cuts in production that have been in effect since the end of last year.